Fig. 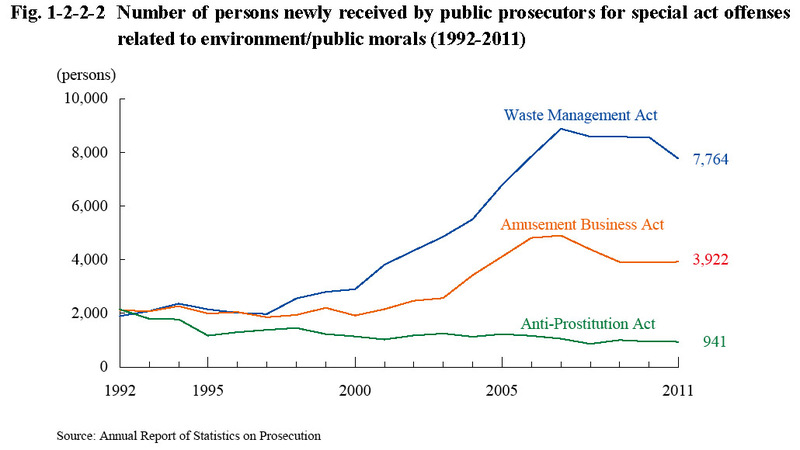 1-2-2-2 shows the number of persons newly received by public prosecutors for violations of the Waste Management Act, the Amusement Business Act, and the Anti-Prostitution Act (Act No. 118 of 1956) over the last 20 years (See Appendix 1-4). The number of persons received for Waste Management Act violations was increasing every year from 1998, but then turned to follow a slightly decreasing trend from 2008, and decreased by 9.3% from the previous year in 2011. The number of persons received for Amusement Business Act violations was increasing every year from 2001, but then decreased in both 2008 and 2009, and remained basically stable from 2010. However, it slightly increased by 0.2% from the previous year in 2011. The number of persons received for Anti-Prostitution Act violations was on a generally decreasing trend in recent years, and slightly decreased by 0.9% from the previous year in 2011.